The last show of April kicked off with a surprise appearance from two of the men that run NOTBPW: Dan and Jeremy Stone!! Their other brother Ricky then won the Super Slam Battle Royale, but who will he face at Mid Summer Madness...?! Two, big strong men kicked off the in-ring action tonight. Danny Cavanagh is an absolute tank, and as strong as Akima Brave is, the big Samoan found it hard to move Cav around! In the end, Brave was able to hit some decent power-based moves, but only because Cavanagh had tired somewhat. For the finish, Brave was stunned by a big boot, and then walked onto a Sit Out Spine Buster! DaLay asked for someone answer him... In the ring... but what he got, was Donte Dunn!! Dan DaLay didn't waste any time here. As soon as the bell rung, he was on Donte Dunn. The fun-loving Barbadian didn't know what hit him, with a brutal lariat and then some stiff elbow strikes. He then hit his 'DaLay Down' Headbutt after 5 minutes to end the match! Dan DaLay with the victory, and he was still angry after the match... He demanded answers again, until Alex DeColt arrived!! After that shocking moment, we were backstage where the jovial CanAm Blondes were celebrating their win at Super Slam!! They were basically skipping along the corridor... high fiving backstage employees... Until they came across Jack DeColt!! The NOTBPW Canadian Champion was less than impressed that an Owen Love outburst caused him to DROP his Title Belt on the floor...!! 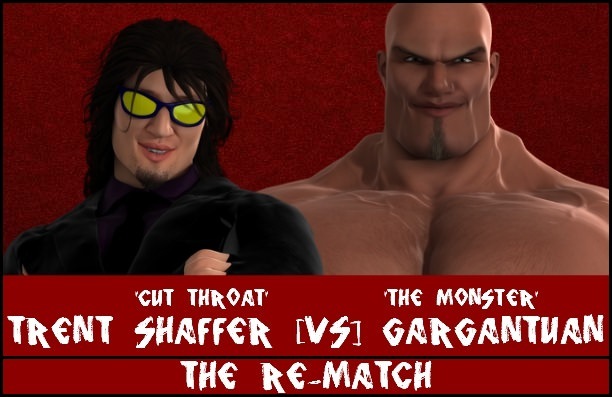 He was so angry, that he challenged the NOTBPW veteran to a match... in the Main Event!! Tonight was the last night Jared Johnson and Johnny Bloodstone would be appearing on NOTBPW Championship Wrestling. They leave for USPW and TCW respectively. Tonight, they were destroyed by Mutant, and to a lesser extend, Aldous Blackfriar. 'Dark Watch' Aldous Blackfriar ended it after 6 minutes with his 'Batwing' submission finisher on Johnson. Next up, it was time for Aaron Andrews to make his NOTBPW Championship Wrestling debut... teaming with Sonny Wildside!! This feud between Sonny Wildside and The Shooters all started when he fought Ernest Youngman at the beginning of this month. He won the match, and Ernest was then offered the chance to join Sean Deeley's group after they attacked Wildside. Then in the Super Slam Battle Royale, Wildside and his new friend Aaron Andrews eliminated all of Deeley's team before he could enter the match! In this match, despite their vast experience as a duo, Dean Waldorf and Marv Statler were no match for Wildside and Andrews. Andrews ended hit by hitting the amazing 'Hot Shot' on Waldorf. He's been in NOTBPW for almost 8 years now... In that time, he's held the Canadian Title for a combined 3 years plus!! In March 2010, he and Johnny Bloodstone also won the Ed Henson Memorial Tag Team Cup!! Katie Cameron and Duane praised Edd's performance in the Super Slam Battle Royale, where he almost won the thing...!! Edd confirmed that he and Duane would take on World's Most Wanted, and bring the Championships back to their 'Glorious' Family...!! Harrison Hash is a former Television Champion in NOTBPW, so he knows how to hang in the ring with someone as talented as James Hernandez. However, the current Champ is a fast mover, who Hash struggled to get a hold of tonight. Hash's normal tactic is to pin his opponent down, and ride him with submission attempts and counter holds. But he couldn't catch Hernandez and keep him in his grasp for long enough tonight. In the end, Hash landed on his feet after attempting a Moonsault, but as he came down, Hernandez super kicked him in the face, and picked up the win! The young DeColt brother outlasted 29 other men to win the Super Slam Battle Royale this past Saturday night...!! Westybrook went on to say that the only thing 'Mighty' about Cavanagh is the size of his big mouth!! 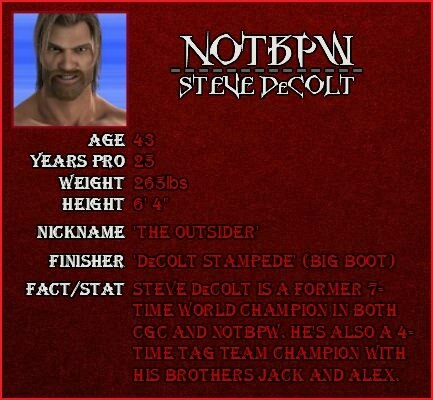 He then informed Ricky that next week, he and Jack DeColt would take on Ricky and his other brother Steve!! Owen Love knows how to pace himself to go the distance, and he attempted to do that here. Jack DeColt prefers a shorter match in which he can get in and get out as unscathed as possible. Jack couldn't get rolling early on, and he spent a lot of time rolling to the outside of the ring to regain his composure. The turning point in the match was a huge lariat to the onlooking Natural, who was just stood there watching! With The Natural down, Owen Love went to check on his friend. This allowed Jack to control the ring, and when Love slid back in full of fire and anger, Jack took him down and stayed on him! The DeColt brother is a brawler who can fight anyone 1 on 1, and he battered Love from that point on. Late on, Love had a comeback in him, but it didn't last long. He walked on to the 'End of Days' from the Canadian Champion, and he was pinned! Jack DeColt decided to stick around and watch the beat down... But it was soon interrupted by Jack's brother Steve DeColt!! Steve's arrival forced an exhausted Jack to exit stage left, allowing a free run at Vessey and Price for 'The Outsider'!! He ran Price over with a shoulder tackle, and then picked Vessey up and threw him across the ring!! The two youngsters slid out of the ring to avoid further attacks from Steve DeColt, and he stood in the ring looking powerful!! Never seen that before!! This game just continues to surprise me! !